You are probably thinking this post is going to be about oil. ZZZZZZ… This is about fair trade coffee. I’m a big coffee drinker and passionate about it. When I have the choice I always choose fair trade and organic. Sadly South Korea (at least Jeju-do) has very few options in those regards. Although I think things are slowly changing here. You can get organic coffee served to you at a few places, but I haven’t found anywhere that you can purchase whole beans. And fair trade seems to be unheard of here. 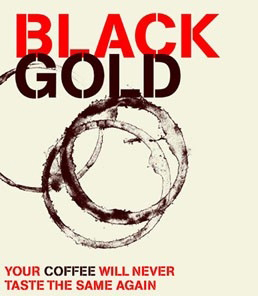 This movie called Black Gold addresses many issues surrounding the environment, world economics, corporate interests and coffee, of course. If you drink coffee I think it is a must see. Even if you don’t drink coffee I think it gives a good perspective of issues related to developing nations and corporate and economic impacts in those nations.